Photo 1 of 44, SOLD! 69 Camaro RS SS Clone! 350 /Auto! SOLD! 69 Camaro RS SS Clone! 350 /Auto! SOLD! Ready to Cruise this Summer! 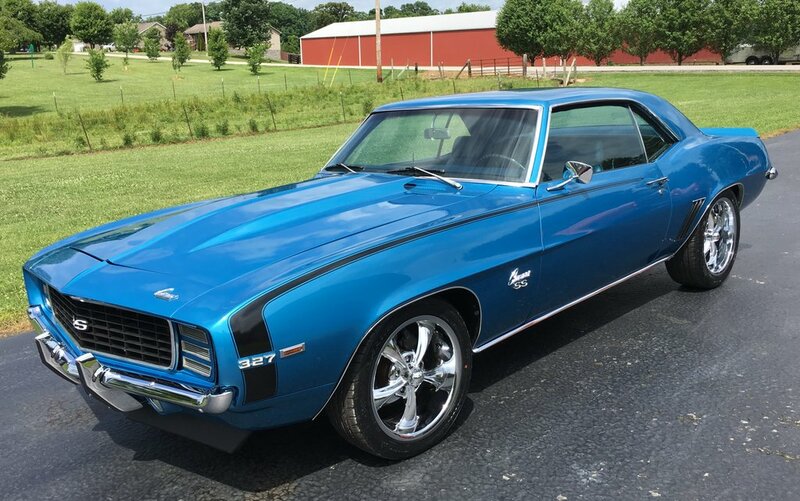 Nice 1969 Camaro RS SS Clone! 350 Engine, Auto Trans, PS, PDB! COLD A/C! New Lemans Blue paint with Black Hockey Stripes! Has nice Blue Bucket Seat Interior with Auto Console. New Door, Roof Rail and Trunk Weatherstripping. Nice Bumpers with front & rear Bumper Guards! All Chrome looks nice! Good solid Floor Pans and Trunk. Camaro is running a new set of Riddler Wheels and Tires! New Flowmaster exhaust that sounds awesome! Cold Vintage Air.....Good old car for the money. Phone 606-878-5839 or 606-521-4156. Album by Herman's Classic Cars, LLC. Photos by C. Bowling. 1 - 44 of 44 Total. 26415 Visits.